Raise your hand if you LOVE snickerdoodle cookies. This classic cookie recipe is always a hit any time of year, especially during the holiday season. Christmas Snickerdoodles will have Santa sliding down the chimney to get his fill. 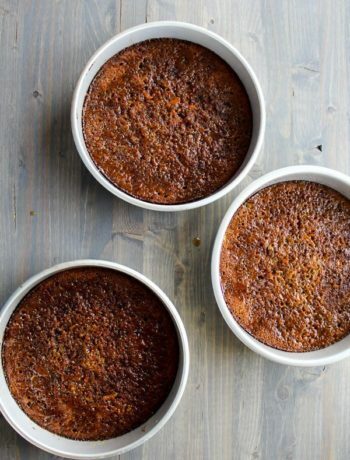 These cinnamon-sweet treats are perfectly soft and chewy. Rolled in a little extra sugar, cinnamon, and nutmeg, these darling little cookies will be at the top of your Nice List. BONUS: Get our Free Printable gift tags for your homemade goodies this season. 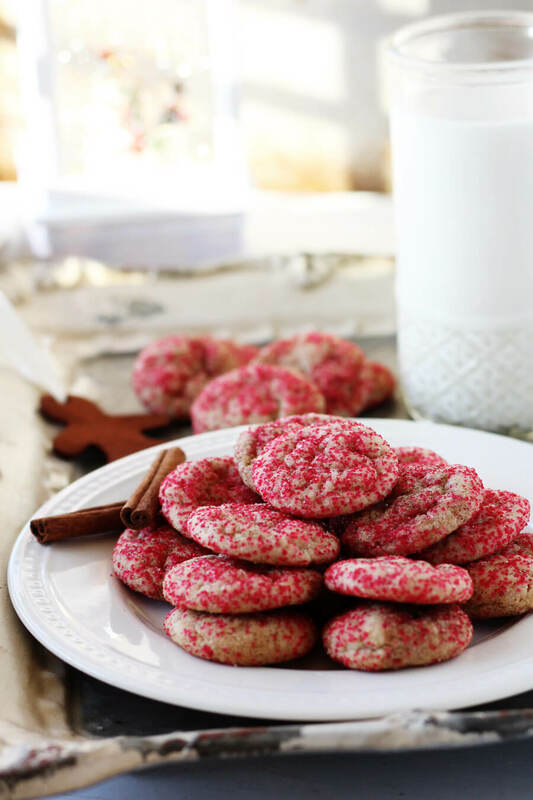 Christmas Snickerdoodles are the perfect holiday cookie! Ever notice how snickerdoodles are the first cookie to disappear? That’s because people love them. I think they are so popular because they have the perfect chew. Soft. Sweet. Just a hint of saltiness. And the cinnamon. You can’t forget the cinnamon. 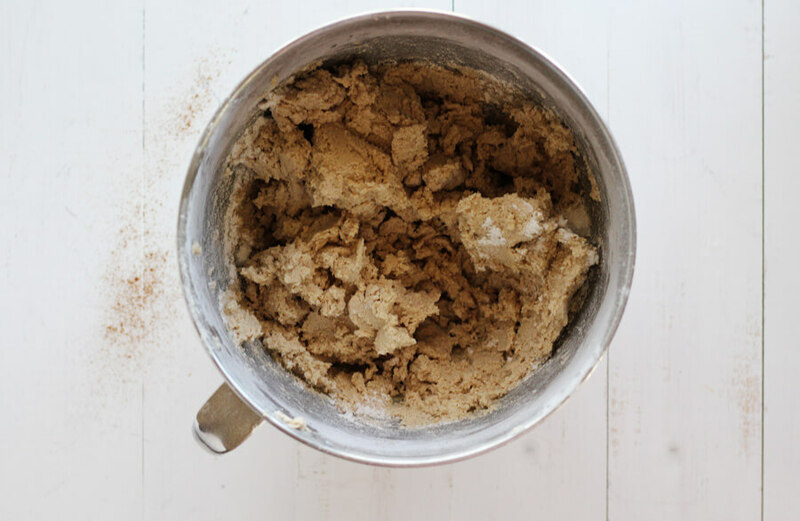 The secret behind any snickerdoodle recipe is the cream of tartar. This baking staple ingredient gives the cookie a little bit of “tang”. 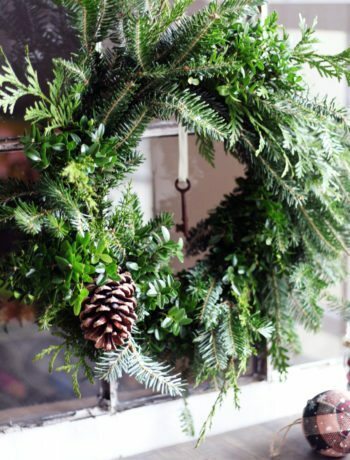 It also helps prevent the sugar from crystallizing and getting too crunchy inside. 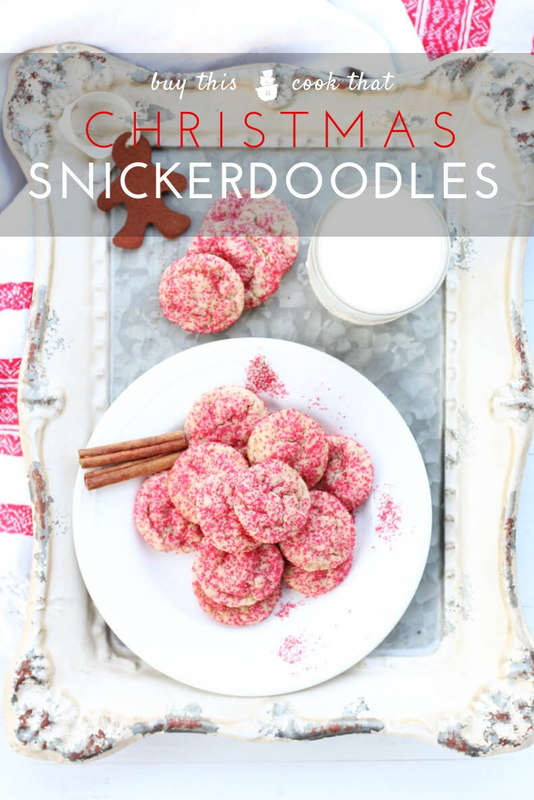 Another secret to this yummy recipe for Christmas Snickerdoodles? Country Crock® Baking Sticks. No need to soften, you can go right from fridge to the mixing bowl. (That makes my holiday baking a breeze.) 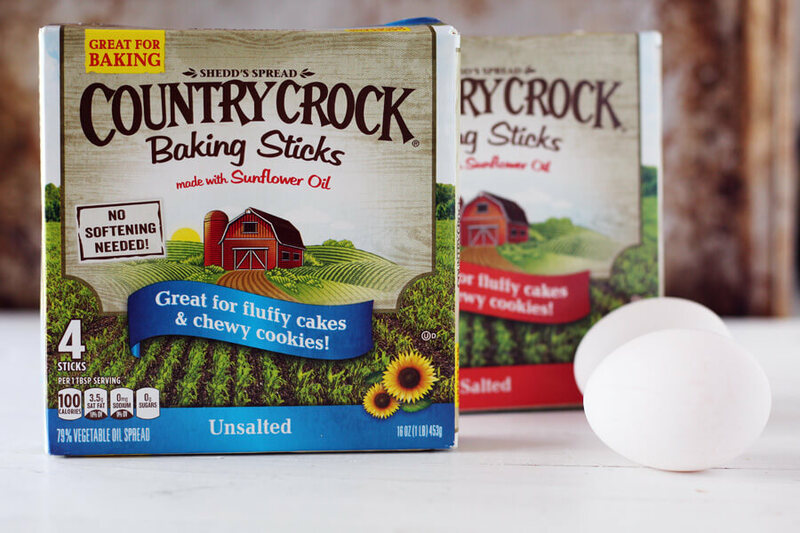 You can find Country Crock Baking Sticks in salted or unsalted in the dairy section at your local Walmart. You probably have most of these ingredients in your pantry already. So let’s make Santa some cookies. Combine the Country Crock Unsalted Baking Sticks with white sugar and brown sugar. Add in one egg and one egg yolk plus the vanilla and whisk until smooth. In a separate bowl, stir together the dry ingredients (flour, cream of tartar, cinnamon, baking soda, and salt). Refrigerate the cookie dough for an hour. Patience, my dears. 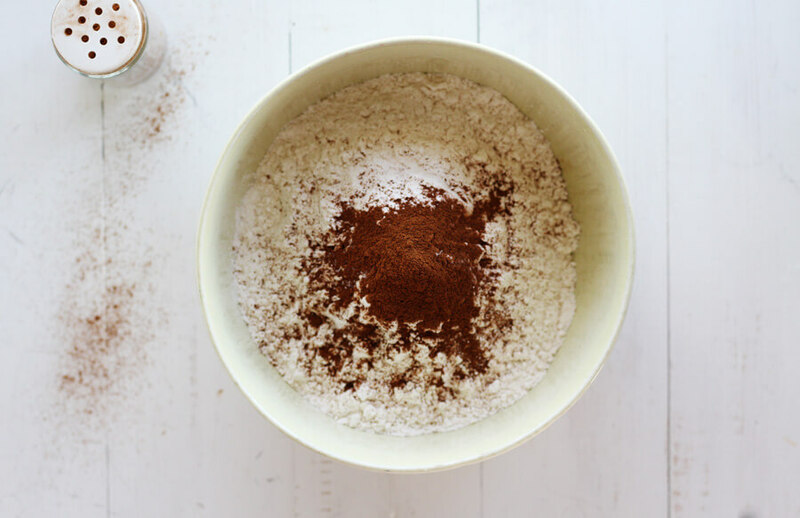 In a small bowl, stir together red sugar, white sugar, cinnamon, and a generous pinch of nutmeg. Using a teaspoon, portion out small balls of cookie dough. 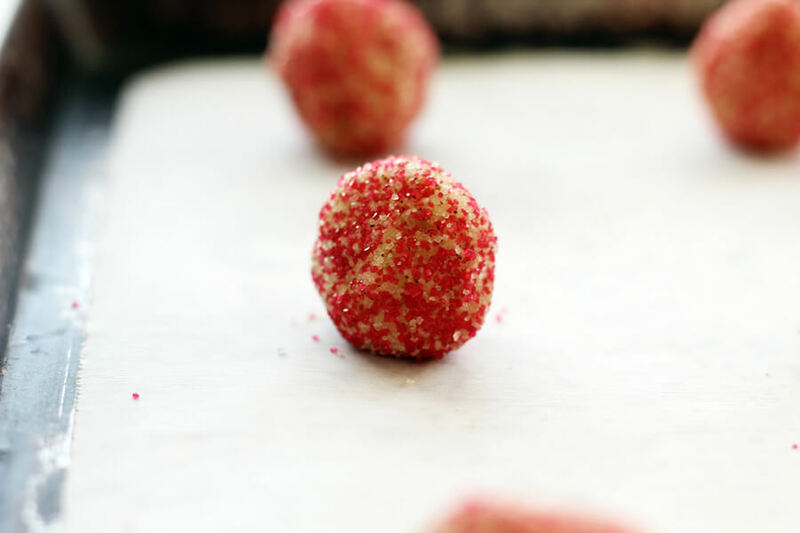 Roll each ball into the red sugar mixture. Arrange the sugar-coated cookie dough balls about 2 inches apart on the prepared baking sheet. Bake for 9 – 11 minutes. Do not over bake. Let the snickerdoodles cool on the pan for 3 minutes, then transfer to a wire cooling rack to cool completely. Cooking times will vary based on your oven, but I’ve found that 9 minutes is just right. They will continue to bake on the pan for a minute or two after you have removed them from the oven. 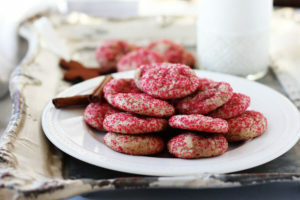 Once they cool these Christmas Snickerdoodles are delicious little bites. You can use any color of decorating sugar you’d like, but my fave color for the holidays is definitely Rudolph Red. For holiday flavor, stir cinnamon and a big pinch of nutmeg into the rolling sugar. Everyone will want to know what you are baking as the smell drifts through the house. This recipe makes about 6 dozen small cookies, which makes this recipe for snickerdoodles perfect for parties and holiday gatherings. And anyone would love to receive a gift tin full of treats. 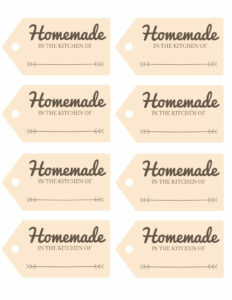 Download our Free Printable gift tags for Homemade goodies here. Country Crock Baking Sticks are creamy and soft – so they’re ready to bake when you are. 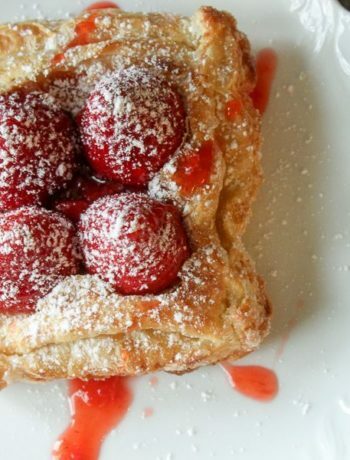 Use instead of butter for holiday baking for delicious results. 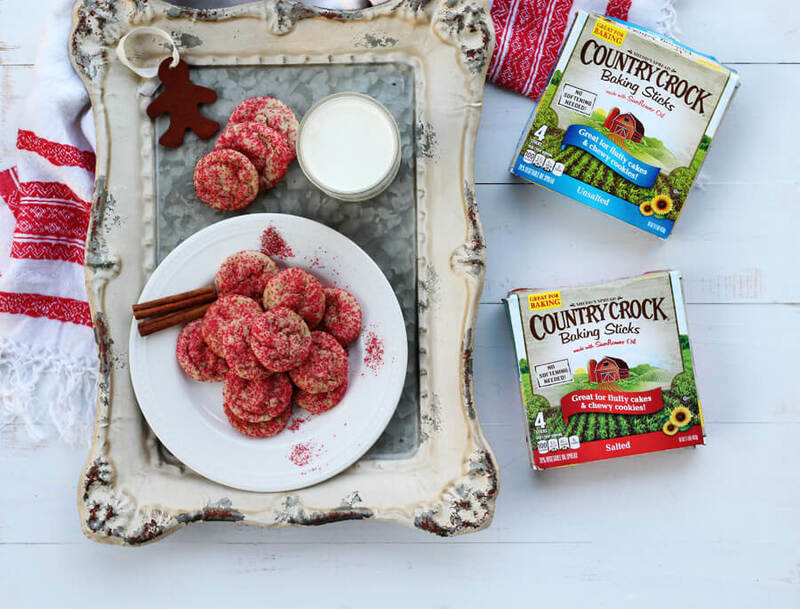 Visit the Country Crock Cookie Exchange for more yummy ideas. I’m definitely adding Country Crock Baking Sticks to my Baking Tool Kit. Serve Christmas Snickerdoodles with a cold glass of milk. Me, I like them with a hot cup of coffee. I call it “gift to self”. Get the complete ingredient list and how-to at the bottom of this post. Don’t forget to download these free printable Gift Tags. Just download, print, and snip. Chewy, soft, and just the right amount of sweetness for the holidays. 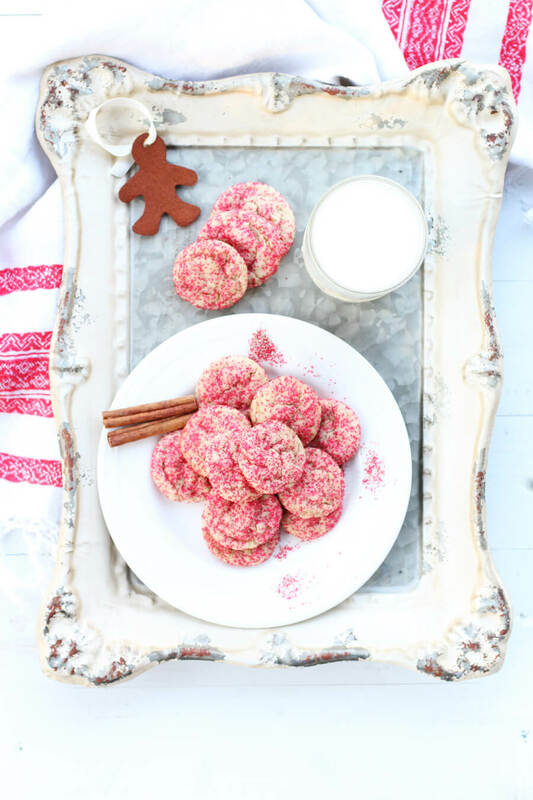 Santa's new favorite cookie are these delicious Christmas Snickerdoodles. 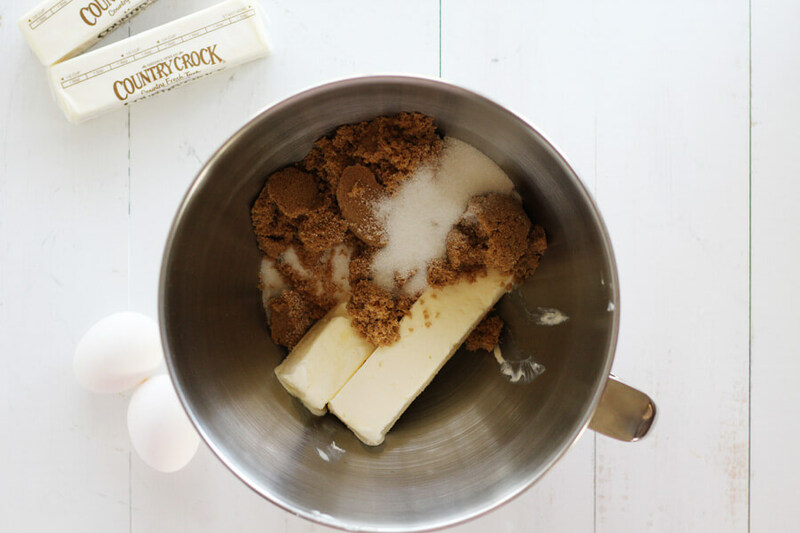 In a large bowl, whisk the baking sticks, brown sugar, and white sugar together until smooth, about 2 minutes. Add one egg plus one egg yolk. Add the vanilla. Whisk until well combined and smooth, another 2 minutes. In a separate medium bowl, stir together the flour, cream of tartar, cinnamon, baking soda, and salt. Gradually add the dry flour mixture to the wet mixture. Slowly beat until just combined (do not overwork the dough). Cover the cookie dough in the bowl and refrigerate for one hour. Preheat oven to 325 degrees. Position oven rack to center position. Line baking sheets with parchment paper. 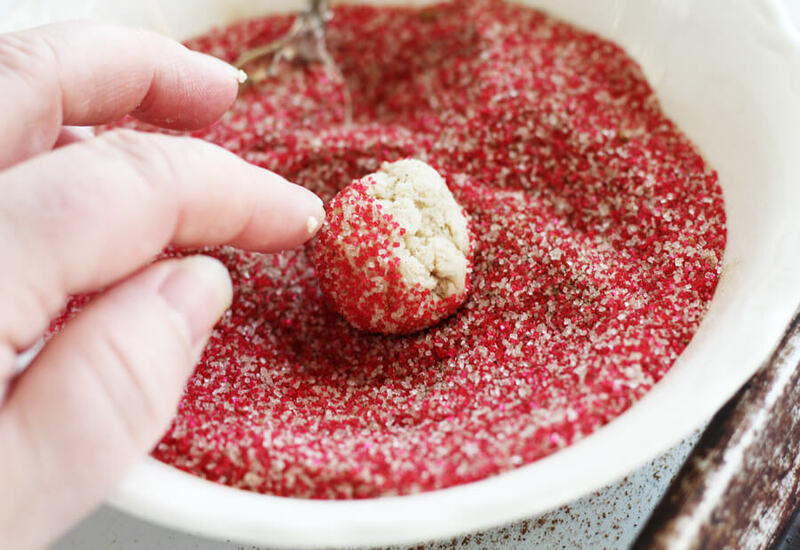 In a small bowl, stir together the red sugar, white sugar, cinnamon, and nutmeg. Using a teaspoon, portion amounts and gently roll into small balls. Roll each ball into the cinnamon-sugar mixture and place on the parchment lined baking sheet. Arrange the dough balls about 2 inches apart. Bake for 9 to 11 minutes. (Do not overcook.) The cookies will be soft. Remove from oven and let cool on the pan for 3 minutes. Transfer to a wire cooling rack to cool completely. Store cookies in an airtight container until serving. 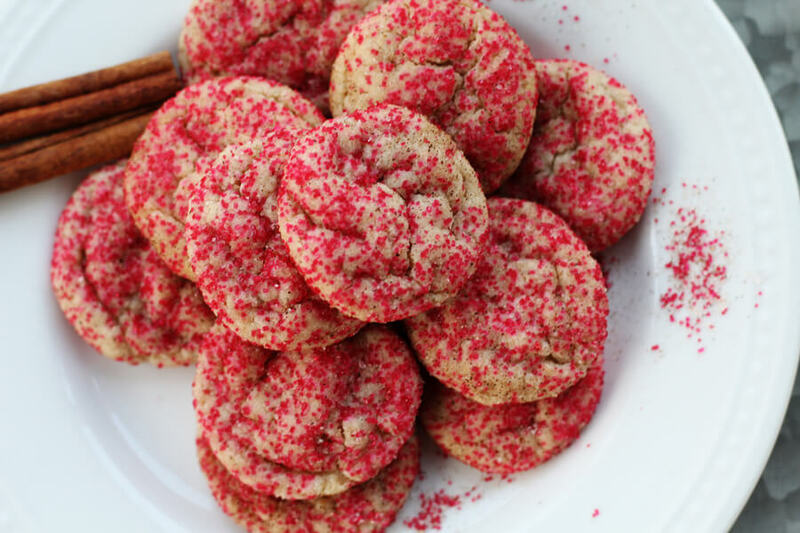 This recipe makes approximately 6 dozen SMALL cookies made from teaspoon-sized portions. You can make larger cookies but note the yield will be less. You may have excess cinnamon sugar coating. Store in an airtight container for the next batch. Thank you, they are pretty delicious. They didn’t last long…I’ll have to make another batch for Santa.